With The Dodgers 13.5 Games Behind The Giants, It Makes Since For Them To Trade A 36 Year Old Starting Pitcher With An Expiring Contract. According to ESPN Boston.com, “Boston Red Sox more likely to make small deadline deal than blockbuster.” Shortstop, right field, and a lefty reliever are all desires. A starting pitcher though, is a necessity. Even when Clay Buchholz and Jon Lester come back, either Tim Wakefield, Alfredo Aceves, Andrew Miller, or Kyle Weiland will still be in the rotation. Wakefield has a WHIP of 1.33, Aceves is more valuable in the bullpen, Miller is averaging a walk every 0.71 innings, and Weiland is just a rookie. Kuroda on the other hand, has a record of 6-11 (which isn’t his fault as the Dodgers have averaged just 2.18 runs per game in his starts), an ERA of 3.13, a WHIP of 1.20, averages a walk every 0.25 innings, and made his professional debut in 1997 as a member of the Hiroshima Toyo Carp in Japan’s Central League. Kuroda has been pitching in MLB with the Dodgers since 2008. Kuroda like Jose Reyes and Ryan Ludwick has an expiring contract and is due about $4 million for the rest of the season. One thing to take into consideration is that Kuroda has a complete no-trade clause in his contract. However, according to reports, Dodger management has contacted Kuroda about waiving his no-trade clause. Yet, Kuroda hasn’t given the Dodgers a list of teams that he’ll accept a trade to and each day it starts to look less and less likely that Kuroda will waive his no-trade clause. One last thing to note on his no-trade clause is, that there is a rumor the Kuroda won’t accept a trade to an east coast team. Kuroda has mixed postseason numbers. In 2008, he went 2-0 with a 1.46 ERA in 12.1 innings. Yet, in 2009 in a start against the Phillies, he gave up six hits and six earned runs in just 1.1 innings pitched. Despite his horrible start back in 2009, there is no reason that Kuroda shouldn’t be able to pitch in the 2011 postseason like he did in the 2008 one. With the Dodgers’ current financial state (for starters, Manny Ramirez, Juan Pierre, and Andruw Jones are owed a combined $15,033,333 at the season’s start), they might try to trade every player they can in order to dump salary, as owner Frank McCourt has barely met payroll according to reports. 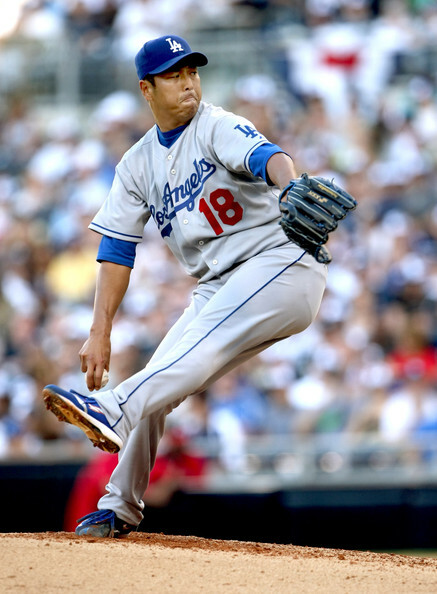 Kuroda is the second highest paid player on the Dodgers behind Rafael Furcal, the only players in eight figures. Depending on the availability of Ubaldo Jimenez, Kuroda is probably the best starting pitcher on the market. Kuroda is also one of the most likely players to be traded to the Red Sox. The Indians, Tigers, and Yankees are also looking at Kuroda just to name a few teams. At the end of the day, sports are simple. To win you just have to score more runs than your opponent. Wether you win 100-1, 1-0, or 10-5 a win is a win. Winning by fifty counts as the same amount of wins as winning by one. When you look at the standings, it doesn’t say, On May 10th this team won by 2 runs but walked 10 batters and had fewer hits than their opponent. All it says is that this team has won so many games and lost so many. Sports may be simple, but winning isn’t. So far this year, the Cincinnati Reds have scored the third most runs per game (4.82) and the most in the National League. Yet, the Reds are just two games above .500, are third in the N.L. Central and have the 13th best record in baseball. 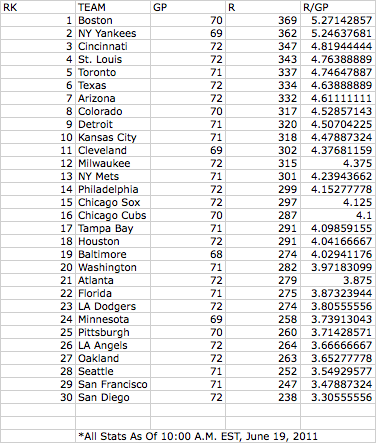 The reason for this is that the Reds have a team ERA of 4.13, the fourth worst in the N.L. and the twenty second worst in baseball. 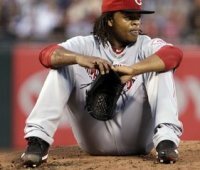 A Big Reason For The Reds' Pitching Woes Has Been Edinson Volquez, Who Has An ERA Of 5.61 This Season. As for their ideal team percentage (ITP, Where a team ranks among MLB team in runs scored per game and ERA) the Reds are a 42%, (3+22)/60=42%. Keep in mind that the lowest, what a team wants to be, a team can be is 3.33% and the highest is 100%. And yes, I made that stat up. But lets look at a team that is .500, like the Pittsburgh Pirates. For starters, what Clint Hurdle has done is amazing and very noteworthy, but that is a different story. The Pirates (35-35), currently rank 25th in MLB in runs scored per game (3.71) and are 8th in ERA (3.52). (25+8)/60=55%. "So even though the Giants have four more wins than the Pirates, they have the same ITP." 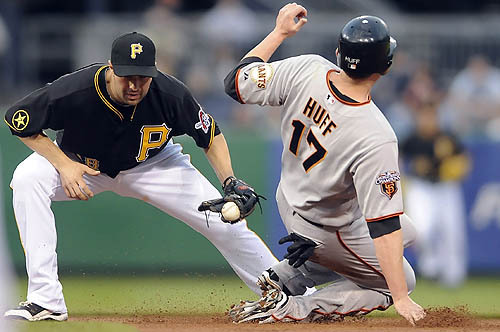 One of the more interesting teams this year, are the San Francisco Giants. The Giants have been having to deal with injuries all year long, including the loss of 2010 N.L. Rookie of the Year, Buster Posey. The Giants who are currently leading the N.L. 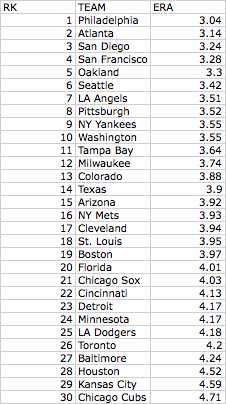 West by just half a game are scoring just 3.48 runs per game, the second worst behind San Diego in MLB. Yet, they have the fourth lowest ERA (3.28) in MLB. All this means that the Giants have an ITP of 55%. 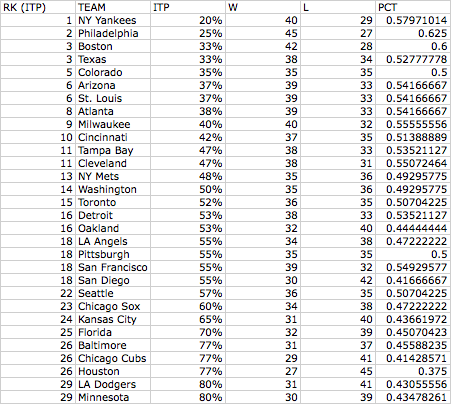 So even though the Giants have four more wins than the Pirates, they have the same ITP. But, we wouldn’t be done if we didn’t mention the Red Sox. Boston is first in the majors in runs scored per game (5.27), but Boston’s team ERA is 3.97, or 19th in MLB. This is largely due to inconsistent pitching by John Lackey, Bobby Jenks, and lets not forget Dennys Reyes’ three earned runs, two hit batters, and two walks in just 1.2 innings pitching. This all before being designated for assignment on April 8th. Boston has an ITP of 33%. For more information on ITP look at the following screenshots from Microsoft Excell.